Google has released a nice update to the Chrome browser for Android devices with several improvements and new features. One of the new features is the ability to tap a word on a webpage and Google will provide you information about that word or phrase at the bottom of the screen. It is a handy little feature, especially if you run across a word you aren’t sure of the meaning or usage. This update, version 43.0.2357.92 on Android phones for those keeping score at home, is available now and includes several other updates that make it a worthwhile download. If you haven’t tried Chrome on your Android tablet or phone, now is a good time to give it a go. I personally have it set as my default browser on all my devices as it is pretty solid and easy to use. 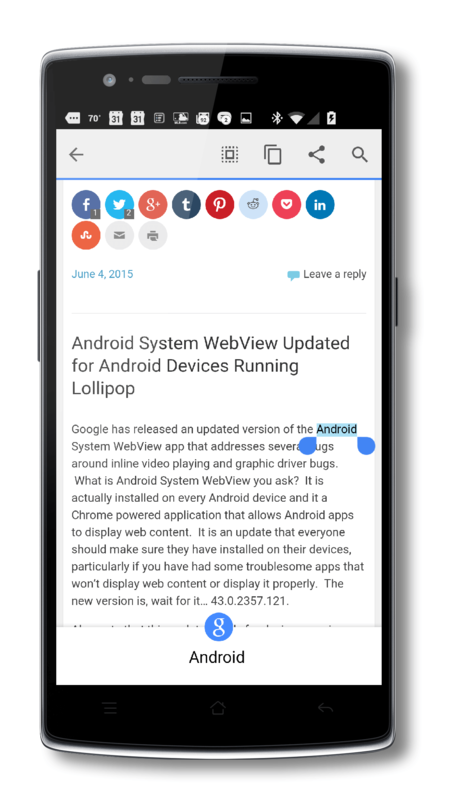 To use the new touch to search feature is used by tapping on a word while viewing a webpage. When you do that, the Google Search icon will pop up at the bottom of the display where you can then swipe up to see the definition or other information about that word or phrase. It is quick and easy an in my testing worked on every word that was not in a hyperlink. Along with this new search function is improved checkout with your Google Wallet. Now you can much more quickly and securely complete your checkout forms with data from your Google Wallet which should speed up that checkout process. Finally, there are a bug fixes and other improvements in Chrome to speed it up and increase stability. I personally didn’t have many complaints about Chrome prior to this update and afterward, I’m not seeing a huge jump in performance but be aware that they are there. If you were having odd behavior or issues with Chrome before, try this update out to see if it addresses those issues.